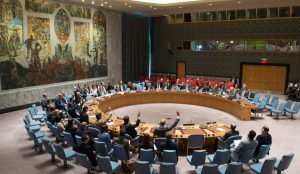 The UN Security Council has extended UNSMIL’s mandate until 15 September 2019 (Photo from archives). The UN Security Council adopted resolution 2434 on 13 September 2018 extending the mandate of the UN Support Mission in Libya (UNSMIL) up to 15 September 2019. The UN describes UNSMIL as an integrated special political mission. It was first established on 16 September 2011 by UN Security Council Resolution 2009 (2011) at the request of the Libyan anti-Qaddafi authorities (NTC) to support the country’s new transitional authorities in their post-conflict efforts. UNSMIL’s mandate was modified and extended by the Security Council in resolutions 2022 (2011), 2040 (2012), 2095 (2013), 2144 (2014), 2238 (2015), 2323 (2016). Its last mandate was stipulated by UN Security Council Resolution 2376 (2017), which had extended UNSMIL’s mission until 15 September 2018. Yesterday’s 2534 mandate extends its presence in Libya until 2019.